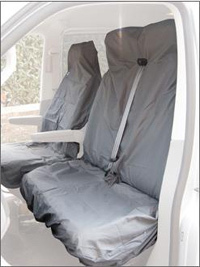 Single and Double Van Seat Cover Sets. Universal and Extremely strong, heavy duty water resistant seat covers. They are very well made and an excellent investment to protect your seats from dirt, grease, oil, water, food and drink. Made from heavy duty high density nylon fabric. Van Plywood Shelving and Van Plywood Racking Storage Systems. A unique modular design which is fully adjustable to be adapted to suit personal requirements. Units can be bolted together to create extra length and extra shelves can be added along with extra dividers so creating a bespoke solution for racking/shelving needs at affordable prices. Universal 3 metre safety approved crash tested pipe carriers manufactured from light but strong powder coated aluminium tubing, combined with tough aerodynamic, glass reinforced plastic end cones, to ensure minimal wind drag and maximum style. Both end cones are fitted with keyed alike, high quality stainless steel locking mechanisms. The Rhino SafeClamp is a revolutionary universal safe clamp design for the safe transporting and securing of ladders onto roof bars and racks. Black modern appearance works well with Ultibar, Maxrack or Rhino productss. 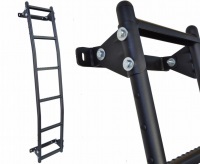 Supplied with universal fitting kit which will fit roof rack bars Up To a maximum size of 60mm x 40mm this covers most van roof bars on the market. 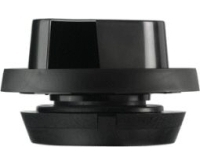 Roof Ventilators which provide round the clock ventilation for vans, buses, ambulances, 4x4s, boats and buildings. 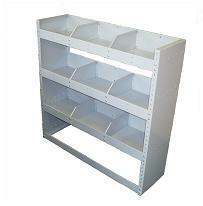 Professional Modular Van Shelving - Suitable for Plumbers, Electricians and Engineers. The dividers can be removed or repositioned as required. Finished in powder coated light grey and are supplied with bracketing to allow fitting of units into the van, or to join multiple units together. Professional Van Racking Solutions, for the Professional Tradesman. 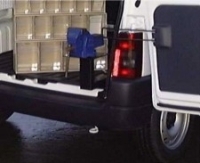 The racking units are fully adjustable to fit virtually any van and has various different shelf combinations. Made from high quality pre galvanized steel riveted construction hinged lids lid stays & handles. Finished in a tough yellow and black powder coating. All tool stores can be fixed through the floor of the vehicle for added security. Made in Great Britain. Van Slide Out Vice Holder. The slide out vice beam is essential for any mobile engineer or builder to comply with onsite health and safety. The sliding arm can extend Up To a meter long but still giving you a rigid platform to work on.The vice holder is supplied with a 4 inch engineers vice or as part of a package with bolts and fixings included.